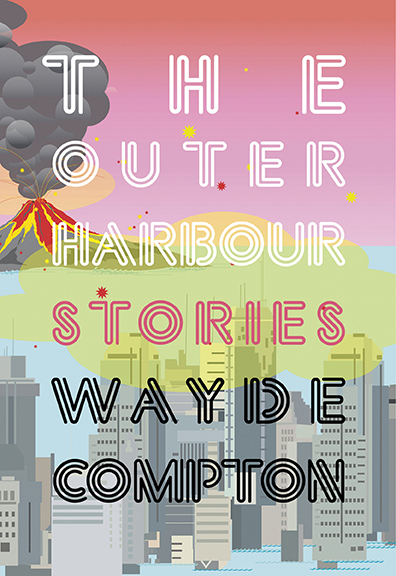 In The Outer Harbour, a collection of loosely related short stories, Wayde Compton employs speculative fiction to explore the complex relationships between place, identity, history, and urban environment. The characters therein use art, drugs, and activism in varyingly successful attempts to firmly ground themselves in the rapidly changing city of Vancouver: a city that both informs their identities and is itself changed by them. The first few stories in the collection fit a traditional short story form, but as the reader progresses, she encounters increasingly uncommon story structures. Incrementally, Compton utilizes visual narratives that are decidedly unconventional to tell stories about the gentrification, power, location and dislocation experienced by his characters from the turn of the twenty-first century through the year 2025. Some are told entirely through images of proposed floor plans for luxury real estate built on government claimed territory just off the city’s shore, others in posters spurring radical action against the corporate land grab and sponsored by “the Anti-Colonial Solidarity Forum.” Still one is told as a “reverse-chronological annotated bibliography” for a paper on an imagined anti-consumerist art movement, another through the transcript of a political radio broadcast. Compton’s skill shows itself in the remarkable cohesion of multiple narrative threads that appear across the manifold creative ways in which they are woven together. In one such thread introduced in the first story, “1, 360 Ft³ (38.5 M³),” a mixed-race student becomes infatuated with an artist of ambiguous ethnicity who emerges from a shipping container of unknown origin found at the Vancouver terminal. She speaks an unintelligible language, and with no clue as to where she’s from, the proper authorities are unable to determine her legal status, her place of belonging, or decide her future. Without the rubric of race and ethnicity applied, she is unclassifiable, and therefore both powerful and vulnerable. Another thread which is centered in the stories “The Lost Island” and “The Boom” follows the emergence of the heretofore underwater volcanic island on which an indigenous activist was killed by police while protesting government occupation of sovereign land. After undergoing development, the island becomes home to a detention for a migrant community like none before encountered. Though the island’s history appears to unfold quickly in just a few decades, the events that occur there exist as a cracked mirror through which the entire colonial history of the country is brought sharply into focus as an ongoing process with daily repercussions. As if murder by police and enforced detainment weren’t frightening enough, “The Secret Commonwealth” introduces a previously known character, a documentarian, to the world of fantasy live action role-play, where he uncovers a disturbing connection between the members of the gaming community and new technologies used in the repression of peaceful protest and crowd dispersal. These simulation technologies, used both for play and power, open up the possibility of joyful persecution and confuse the concept of “real” or “true” identity. Though suspicion that the common factor uniting these stories is something unknowable or otherworldly is tempting, Compton achieves the more troubling, yet ultimately more satisfying, goal of portraying the fantastical as something that is very much rooted in what we think we already know about ourselves and our world. These stories confront the reader with the inescapable logic that, despite the very real social realities that result from them, identity markers like race, gender, class, and nationality are themselves projections based in relative and ever-changing contexts of unreality. These projections are revealed as such when we recognize them as art, as performance, as simulation. They are also relative to where we are, whether that be on the island, the mainland, or in the outer harbour. In fact, Compton shows us, this is true in the future because it has always been true. It may just be that the glitches in our perception grow brighter as we develop new tools for making, and hopefully eventually, recognizing them as our own creations, as us.